This short film will be paired with Inhabit: A Permaculture Perspective. Stay after the films for discussion and to hear from GreenCorps Chicago, as they share about youth summer job opportunities, some in the fields of sustainability. Also learn about green activities, and hear about concrete, local opportunities for action from Faith in Place and other relevant advocacy groups. Facilitator: Wendy Williams. FILM DESCRIPTION: Organic gardener and vegan chef Ietef Vita is an award winning international recording artist and activist who uses Hip-Hop culture to inspire young people to connect to the earth by teaching them how to grow food and cultivate healthy eating habits. Through his lyrics and gardens, Ietef is planting the seeds of the food movement extending from his hometown of Denver, Colo., to across the globe. 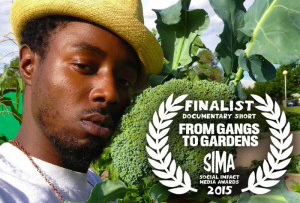 Watch From Gangs to Gardens trailer below. From Gangs to Gardens Trailer from JLove Calderon on Vimeo.